Two large twin brothers who both have the same name as they come from a culture that named twins with the same name. Both brothers tend to finish each others sentences. Because they look identical, some of their teammates are confused on which is the older and younger brother. 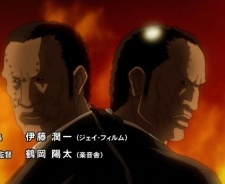 In the manga, only one of the Nabuu brothers appears (as a minor character with no lines), since the other brother was killed by Ranguren in Ga-Rei Zero. The only Nabuu left was also killed trying to save Fujiko Mine when the Juugondou attacked the Ministry.